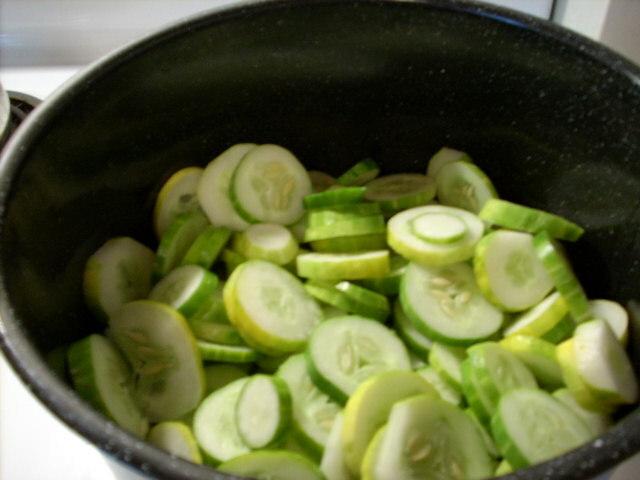 7 pounds of cucumbers, washed and sliced. Place in large container-no metal or aluminum. Use glass, crockery, enamel, stainless steel or plastic. Mix 1 cup pickling lime to 1 gallon water. Cover face with a bandana - it is very "dusty"...don't breath it or get it in eyes or on skin. Read instructions/cautions on label. Pour over cucumbers, let stand covered for 12-24 hours. Rinse 3 times in cold water, or until liquid is clear. Put into iced water and/or let stand overnight in fridge. Mix 2 quarts vinegar, 1 t. salt, 2 T. spices and 12 cups sugar together and bring to boil. 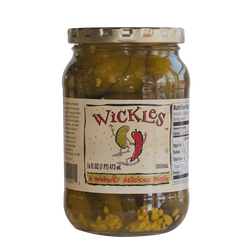 Put in pickles and let stand overnight*, (*I skipped this since I had already waited 2 days) then bring to a slow boil for 30 minutes, put them jars that have been sterilized, wipe rim with clean wet cloth. Use seal and rings that have been sterilized. I also added 1 t. dill, and a 1 T. crushed red pepper.